Nobody imagines a tick can talk. That's because no-one thinks to engage the tiny parasite in conversation. Except Jock McConnell. When Jock's tick first attached itself to his lower leg during a stroll through the heather in the hills around Pitlochry, he was completely unaware. As a former Scottish flyweight boxing champion, Jock was used to pain. Big pain, not wee nips. So he never noticed the tick jabbing its hook into his flesh. 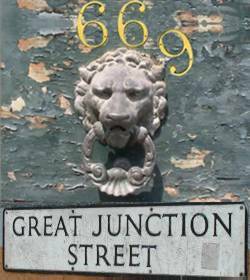 It wasn't until Jock returned to 666 Great Junction Street that he felt the itch above his right foot. He clawed repeatedly at the miniscule lump. There was a yelp. A little muffled, but most definitely a yelp. As he rolled up his trouser leg, the stifled cry grew sharper. Jock pulled off his boot and sock and gazed at the tiny black spot wriggling just above his right ankle. 'I've had worse,' said the tick. Jock was glad of the company. He'd only spoken to the landlady briefly upon his arrival in Pitlochry two weeks ago and the unending stillness of the highlands had unnerved him. A life of loud noises was not easy to shake off. Especially if a lot of those noises were delivered at point blank range to the face and body through a boxing glove. Still, he'd earned his solitary break and, hey, he'd even found a new companion, even if it was just a small bloodsucking parasitic arachnid. 'Why'd you choose me?' asked Jock. The tick resumed its sucking, its body already swelled to twice its initial pinhead size. After a few more gulps, it stared at Jock. 'You're a sportsman, aren't you?' it said. Jock retrieved the plastic folder under the bed stuffed with newspaper cuttings he'd collected since his rise from local boot boy made good and unfurled a scrap of paper torn from the sports pages of The Sunday Mail. 'I'm sorry to hear that,' said Tock. Jock stared out the window at the back end of the New Kirkgate shopping centre. 'Do you mind if I keep on sucking?' said Tock.